Citation: Yubin Z, Qun Z, Herbert S. Recent advances in exosome-based cancer immunotherapy. J Cancer Immunol Ther. 2018;1(1):9-16. Following the discovery of their immunological functions in 1996, exosomes have been re-classified from inconsequential cell garbage boxes to critical players in cell-cell communication [1-3]. 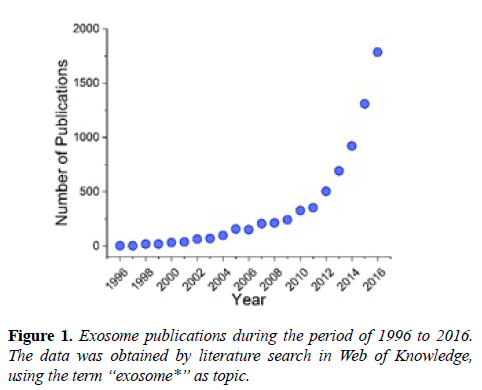 Since then, extensive attention has been drawn to exosomes, resulting in a dramatic rise in publication numbers (Figure 1), and the initiation of clinical trials involving exosomes [4,5]. Currently, the biological functions of exosomes are not yet completely understood, but this seems not to dampen the enthusiasm of immunologists and clinicians in utilizing the unparalleled advantages of exosomes, which include the cell membrane-like structure, the carrier capacity for biomolecules and the capability of immunoregulation . In recent years immunotherapy has demonstrated its potential as an effective alternative for cancer treatment, where conventional treatments like surgery, chemotherapy and radiation therapy failed or were of little effect [6,7]. Accumulating evidence has indicated that exosomes are involved in immunological activities (i.e. modulation of antigen presentation) and cancer development, suggesting exosomes may be a potential target for cancer immunotherapy [8-10]. Also, some exosome properties (i.e. concentration, composition) are cancer-dependent, for instance, the increased number in body fluids of cancer patients . Inspired by these discoveries, exosomes have been explored and tested for cancer immunotherapy [1,8,12,13]. This review covers the current understanding of exosomes in composition, isolation and characterization, and highlights the state of the art of exosomebased cancer immunotherapy, including exosomal carriers, exosome-based immune regulators and engineered exosomes, with a discussion on challenges and future perspectives. Undoubtedly, approaches utilizing exosomes for cancer immunotherapy will only increase in numbers in the future. Following the discovery of their immunological functions in 1996, exosomes have been re-classified from inconsequential cell garbage boxes to critical players in cell-cell communication [1-3]. Since then, extensive attention has been drawn to exosomes, resulting in a dramatic rise in publication numbers (Figure 1), and the initiation of clinical trials involving exosomes [4,5]. Currently, the biological functions of exosomes are not yet completely understood, but this seems not to dampen the enthusiasm of immunologists and clinicians in utilizing the unparalleled advantages of exosomes, which include the cell membrane-like structure, the carrier capacity for biomolecules and the capability of immunoregulation . In recent years immunotherapy has demonstrated its potential as an effective alternative for cancer treatment, where conventional treatments like surgery, chemotherapy and radiation therapy failed or were of little effect [6,7]. Accumulating evidence has indicated that exosomes are involved in immunological activities (i.e. modulation of antigen presentation) and cancer development, suggesting exosomes may be a potential target for cancer immunotherapy [8-10]. Also, some exosome properties (i.e. concentration, composition) are cancer-dependent, for instance, the increased number in body fluids of cancer patients . Inspired by these discoveries, exosomes have been explored and tested for cancer immunotherapy [1,8,12,13]. This review covers the current understanding of exosomes in composition, isolation and characterization, and highlights the state of the art of exosome-based cancer immunotherapy, including exosomal carriers, exosome-based immune regulators and engineered exosomes, with a discussion on challenges and future perspectives. Undoubtedly, approaches utilizing exosomes for cancer immunotherapy will only increase in numbers in the future. Figure 1: Exosome publications during the period of 1996 to 2016. The data was obtained by literature search in Web of Knowledge, using the term “exosome*” as topic. Exosomes are cell-derived lipid extracellular vesicles (EVs) with a diameter of 50-200 nm and a density of 1.13-1.19 g/ml, playing important roles in intercellular communication and biomolecule transmission, where donor cells secrete exosomes for the delivery of various biological elements to recipient cells (Figure 2A) [1,14]. Exosomes contain lipids, nucleic acids and proteins (Figure 2B), which vary with the type of the donor cell. According to the exosome data base, ExoCarta (http:// exocarta.org/index.html), more than 1116 lipid entries, 2838 miRNAs, 3408 mRNAs and 9769 proteins have been characterized in exosomes. In the exosomal lipid-bilayer structure, lipid materials like ceramide, cholesterol, sphingomyelin and phospholipid have been reported [1,15]. In addition to lipids, exosomes contain DNA, mRNA and miRNA, which may mediate cellular information transfer. For instance, Valadi et al. reported the existence of mRNA and miRNA in exosomes derived from mouse and human mast cell. What is more, they confirmed the expression of exosomal mRNA in recipient cells in vitro, suggesting a potential role of exosomes in genetic exchange between cells . Among the exosomal biomolecules, most attention has been focused on proteins loaded on/into exosomes, which include heat shock proteins (Hsp70, Hsp90), tetraspanins (CD9, CD63, CD81), antigen presenting molecules (major histocompatibility complex (MHC), I and II), targeting/adhesion proteins (integrins), enzymes (GAPDH), proteins associated with multivesicular body (MVB) formation (Alix, TSG101), cytoskeletal proteins (actin), among others [2,17]. Tetraspanins (CD9, CD63, CD81) have been widely employed as exosome markers, but one should keep in mind that they are not expressed universally by all cell types, e.g., mature B cells not expressing CD9 making it obligatory to select other appropriate markers . Interestingly, MHC molecules have been reported to be beneficial for exosomal cancer immunotherapy [18,19]. Figure 2: Schematic illustration of intercellular communication, composition, isolation and methods of characterization of exosomes. (A) Exosome-mediated intracellular communication. (B) Composition of exosomes including lipids, nucleic acids and proteins. (C-F) Strategies of exosome isolation: (C) Differential centrifugation, (D) size exclusion chromatography, (E) precipitation and (F) affinity capture. (G-L) Approaches of exosome characterization: (G) Transmission Electron Microscopy (TEM) , (H) Nanoparticle Tracking Analysis (NTA) , (I) Dynamic Light Scattering (DLS) , (J) Bradford Protein Assay (BA), (K) Western Blot (WB)  analysis and (L) Flow Cytometry (FL) . Reproduced or adapted from ref [20-22] with permission from Nature Publishing Group and PLOS. Based on the physical or biological properties of exosomes (i.e. density, size, solubility, surface markers), several approaches have been applied for exosome isolation, for instance, differential centrifugation, size exclusion chromatography, precipitation and affinity capture (Figures 2C-2F). Differential centrifugation is the most frequently employed method for the isolation of exosomes. Starting with low speed spinning to remove cells and cellular debris, a final gravity of 100000 × g is commonly applied for pelleting exosomes, while the use of a sucrose gradient allows the efficient removal of non-vesicular particles like protein aggregates [3,23-25]. The differential centrifugation method requires an ultracentrifuge and a long processing time. In term of particle size, exosomes can be isolated by size exclusion chromatography, which can result in a narrow vesicle size distribution and intact exosome structures [26,27]. However, size exclusion chromatography is timeconsuming [28,29]. More recently, isolation of exosomes by precipitation has been realized through solubility reduction and low-speed centrifugation, with several isolation kits being commercially available. The precipitation method significantly simplifies the isolation procedure and reduces the processing time but may compromise the purity through contaminants from other extracellular vesicles and the precipitation reagents [30-32]. Compared to the aforementioned strategies, affinity capture of exosomes, making use of typical surface markers of exosomes (e.g. CD9, CD63, CD81), is able to remove most impurities and harvest relatively pure exosomes. For instance, antibody-coated magnetic microbeads can be used to capture exosomes which contain the target protein on the surface, and the microbead-captured exosomes can be directly used for some downstream characterizations, like flow cytometry analysis. Nevertheless, affinity capture may miss exosomes that do not have the corresponding surface marker, and this method is currently expensive for large-scale isolation [25,33]. In brief, there is still no perfect approach for exosome isolation so far. The development of novel isolation strategies may require further understanding of exosome composition and properties, and the combination of multiple isolation techniques. Modern techniques have been employed to characterize exosomes based on their physical properties as nanovesicles and biological characteristics due to loaded biomolecules. Here, we briefly review the commonly used characterization techniques, including transmission electron microscope (TEM), dynamic light scattering (DLS), nanoparticle tracking analysis (NTA), Bradford protein assay (BA), Western blot (WB) analysis and flow cytometry (FC) (Figures 2G-2L) . Among these methods, TEM, DLS and NTA are most frequently used for particle characterization, while BA, WB and FC are applied for protein analysis. TEM visually depicts the size and morphology of exosomes and enables the viewing of the vesicles, but it generally requires specialized sample preparation and expensive equipment . DLS gives information on both size distribution and the zeta potential of the vesicles in solution, only requiring simple sample preparation and measurement . As a complement to DLS, NTA is able to quantify vesicle distribution and concentration, and is extensively employed in exosome studies [35,36]. BA rapidly measures the total protein concentration of exosomes as an estimation of exosome concentration, but cannot identify specific proteins . WB analysis separates and identifies specific proteins (i.e., proteins of interest or exosome markers), but is comparatively time-consuming . FC is a powerful technique for the rapid analysis of cell surface markers, which has been applied to exosome characterization. It is difficult for standard FC to detect particles under 200 nm. Therefore, different strategies have been employed to make exosomes detectable by FC, such as microbead capture, fluorescence labeling and fluorescence triggering [38-41]. To analyze RNA in exosomes, reverse transcription polymerase chain reaction (RT-PCR) can be performed . All these characterization techniques provide essential and critical information for using exosomes in cancer immunotherapy. The structure and composition of exosomes endow them with both properties of nanomaterials and characteristics of active biomolecules. Thus, exosomes have been studied in various types of cancer immunotherapy (Figure 3). Herein, we report the recent progress in this field. 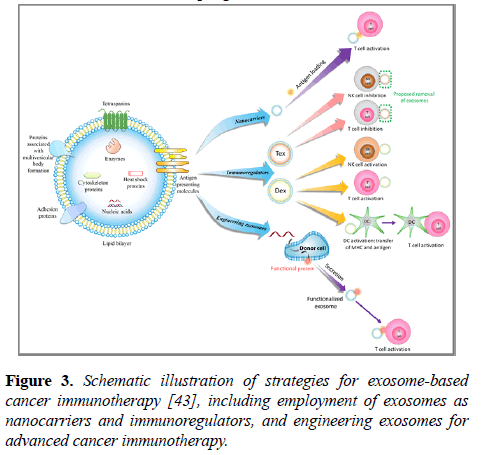 Figure 3: Schematic illustration of strategies for exosome-based cancer immunotherapy , including employment of exosomes as nanocarriers and immunoregulators, and engineering exosomes for advanced cancer immunotherapy. Nanocarriers are promising for various cancer immunotherapies, owing to their outstanding performance in 1) loading capacity of various immunotherapy elements, such as tumor associated antigens (TAAs) and adjuvants, 2) controlled delivery of cargos and 3) passive or active targeting of phagocytes or tumor cell [7,17,44,45]. Among the nanocarriers, lipid-bilayer exosomes, as a natural delivery system, exhibit intriguing advantages, which make them promising for cancer immunotherapy. Exosomes have a similar vesicle structure as liposomes, an artificial lipid-bilayer nanodelivery system, which has already been successfully employed for immunotherapy of cancer [46,47]. In addition, the endogenous origin and loaded biological materials of exosomes endow them with superior power for the delivery of immunological regulators under various physiological and pathological conditions, such as good biocompatibility, non-immunogenicity, natural targeting and high penetration of biological barriers [1,17,48,49]. Mahmoodzadeh et al. decorated MDA MB-231 cancer cell exosomes with staphylococcal enterotoxin B, a bacterial superantigen that binds to MHC II and polyclonally activates T cells, which achieved apoptosis in esterogen receptor-negative (ER-) breast cancer cells [50,51]. More recently, Morishita et al. designed murine melanoma B16-BL6 tumor cell-derived exosomes equipped with both endogenous tumor antigen and streptavidin-lactadherin, facilitating the co-delivery of biotinylated CpG DNA. This co-delivery induced an effective activation of DC2.4 dendritic cells and an in vivo anti-tumor effect in immunized B16-BL6 tumor-bearing mice. Such a strategy incorporating streptavidin-lactadherin on exosome surface may also be effective for the delivery of other biotinylated genes, drugs and antibodies for immunotherapy . Furthermore, exosomes have been successfully employed to overcome the “blood-brain barrier (BBB)” and delivered anti-cancer drugs in a zebrafish brain cancer model, suggesting their potential suitability for brain cancer immunotherapy . Advancements in nanomaterials have enabled the delivery of genes, drugs, antibodies, antigens, adjuvants and cytokines thereby providing valuable tools for effective cancer immunotherapies . Exosome-based delivery systems can build on the existing experience and knowledge on nanomaterial-based strategies, to test their potential unique advantages for immunotherapy. Tumor derived exosomes (Tex): Tex have been found to modulate the immune responses in different ways. Exosomes retain biological substances from donor cells, making them suitable representatives of donor tumor cells that can hide tumors from immune surveillance. For example, B cell lymphoma-derived exosomes carry CD20 which can sequester therapeutic anti-CD20 antibodies, leading to B cell lymphoma escape from antibody-dependent cell-mediated cytotoxicity (ADCC) and complement-dependent cytotoxicity (CDC) . Suppressive immune mechanisms, such as immune checkpoint inhibitors and suppressor cells, are also hijacked by Tex. Acute myeloid leukemia (AML)-derived exosomes carry inhibitory molecules on their surface, such as Fas ligand, PD-L1, CD39 and CD73, and inhibit the anti-tumor response of natural killer (NK) cells by crosslinking inhibitory receptors on NK cells . The inhibition of T cells by Tex is achieved in a similar fashion [57,58]. Regulatory immune cells are also affected by Tex. Mammary Tex can block the differentiation and maturation of dendritic cells (DCs) from bone marrow CD11b+ precursor cells in mice . Instead, Tex steer differentiation to CD11b+ Gr1+ myeloid derived suppressor cells (MDSC) in the spleen . A similar blockade was observed in human DC differentiation from peripheral CD14+ monocytes . Tex can also induce a M2 polarization of macrophages , and stimulate the proliferation of regulatory T cells which both support tumor progression . As many studies have demonstrated Tex to be immunosuppressive, it has been hypothesized that Tex removal by extracorporeal hemafiltration might serve as an adjuvant therapy, especially to enhance the efficacy of TAA-targeting antibodies . It remains to be seen how effective and feasible this strategy will be in patients. However, there are also some studies demonstrating that Tex can boost anti-tumor responses [64,65]. The enrichment of Hsp70 in exosomes has been shown to induce stronger MHC-independent anti-tumor responses . DCs pulsed with hepatocellular carcinoma (HCC) Tex (DC-Tex) induced a stronger anti-tumor immune response than DCs pulsed with the tumor lysate, resulting in an improved HCC tumor microenvironment by reducing the number of CD25+FoxP3+CD4+ regulatory T cells . Dendritic cell derived exosomes (Dex): Dex have been shown to strongly induce anti-tumor response in murine models [67,68], which is dependent on the activation of T cells. Dex activate T cells in two ways, (1) direct activation, and (2) more importantly, indirect activation through antigen-MHC complex transfer to bystander DCs. Dex have been shown to directly stimulate the proliferation of T cells, and to activate T cells in an antigen-specific manner in vitro [69,70]. This direct activation is Dex dose-dependent and reflects the properties of the donor cells, since Dex from mature DCs are more effective than Dex from immature DCs [69,70]. However, the direct T cell activation by Dex is very weak compared to the activation by DCs. Dex alone are not able to activate naïve CD4+ T cells, but require the presence of DCs to achieve a strong T cell activation [71,72]. Dex can be internalized by DCs, followed by processing of antigens in the endosome . The processed antigens can then be presented by DCs. The immune stimulatory mechanism underlying this process is the same as using Tex to pulse DCs. Alternatively; Dex can be trogocytosed by DC after binding. Trogocytosis is a direct membrane transfer, leading to antigen-MHC complex presentation on DCs without further processing. This process is often termed as cross-dressing [74-77]. In addition, Dex can also activate NK cells via Interleukin 15 receptor alpha (IL15Rα), natural killer group 2D (NKG2D) ligands and tumor necrosis factor (TNF) [78-80]. It has been reported that Dex can activate and stimulate NK cells via TNF/TNF receptor interaction, resulting in the secretion of Interferon-γ (IFN-γ) . Four clinical trials have been conducted to treat cancer patients using exosomes derived from tumor antigen-pulsed DCs . In these clinical trials, Dex were well-tolerated and induced enhanced NK effector functions. However, the efficacy of Dex was low. Tumor-specific T cell responses were not observed in patients, which is in stark contrast to the findings in murine tumor models. This lack of T cell response may be caused by the more complex suppressive tumor microenvironment in late stage cancer patients than in tumor-bearing mice. Dex rely on recipient’s DCs to activate T cells, while usually the DCs in cancer patients are hyporesponsive and less in numbers, or T cells are suppressed by the inhibitory tumor microenvironment [80-83]. Interestingly, it has been shown that mammary Tex-pulsed DCs are able to suppress the growth of the tumor. However, the pretreatment of mice with Tex dramatically abolishes this tumor suppression [84-86]. T cells in cancer patients might likewise be pre-suppressed, and therefore not respond to Dex. Another fact to note is that exosomes are mainly cleared by monocytes and macrophages as they have the highest capacity of phagocytosis . However, monocytes and macrophages are not the ideal target cells of Dex since they are not as effective as DCs in presenting antigens to T cells. Therefore, the actual Dex concentration available for DCs may not be high enough to activate T cells. In this case, modification of Dex to better target DCs or to reverse the suppressive activities of MDSC/ tumor-associated macrophages (TAM) may help improve the outcome of Dex therapy. In addition to naturally secreted exosomes, engineered exosomes open new avenues for advanced cancer immunotherapy. Currently, the two prevalent methods for exosome engineering are direct modification of exosomes and donor cell engineering , generally accomplished by electroporation, transfection or transduction . The optimization and refinement of exosomes can enhance exosomal cancer therapy efficacy via strengthened immune response, specific targeting or induction of anti-tumor immunity [4,88]. Gehrmann et al. decorated exosomes with α- galactosylceramide and ovalbumin, and reported a synergistic enhancement of the adaptive immune responses against the tumor, evidenced by inhibition of tumor growth and augmented antigen-specific CD8+ T cell infiltration into the tumor [87-89]. Similarly, exosomes admixed with CpG oligonucleotide adjuvant were able to mediate melanoma tumor rejection . Exosomes derived from TGF-β1-silenced L1210 leukemia cells have been shown to promote DC maturation and subsequent CD4+ T cell proliferation, resulting in a potent anti-leukemia immunity . Yang et al. manipulated EL-4 lymphoma cells to express both ovalbumin and Interleukin 2 (IL-2), and the isolated exosomes induced a stronger anti-lymphoma cytotoxic T lymphocyte activity and inhibited tumor growth . Moreover, by transfection of Rab27a (member of the small GTPase superfamily) into murine A549 lung cancer cells, the derived exosomes could induce preventive as well as therapeutic anti-tumor immunity . Furthermore, with the recent breakthrough in chimeric antigen receptor (CAR) T cell therapy, CAR T cell-derived exosomes have been proposed to be a promising tool for targeted cancer treatment . In summary, engineered exosomes for cancer immunotherapy have yielded promising results, but as this field is still young, more optimization work is required. Exosomes are being increasingly understood as pivotal mediators of intercellular communication and substance exchange, with a promising potential in cancer immunotherapy. A range of studies has already demonstrated the effectiveness of exosomes in various cancer immunotherapy settings. For instance, Dex, able to regulate both DCs and T cells, have been proposed to be a cell-free vaccine and developed for clinical trials [94-96]. The reported findings suggest exosomes to be a powerful tool for cancer immunotherapy. However, as in any young and developing field, there are challenges to be overcome. Current methods of exosomes isolation are time-consuming and expensive, and effective approaches for large-scale exosome isolation are still to be developed. Thus, the development of fast and low-cost isolation techniques that increase yield of exosomes at a high purity is urgently needed. In addition, the type, amount and biological function of biomolecules (e.g. lipids, nucleic acids, proteins) loaded on/into exosomes are not fully known. Due to the complexity in composition, exosomes have shown both immunostimulatory and immunosuppressive effects, which must be considered when employing exosomes for cancer immunotherapy . Although exosomes are considered to be safe, biocompatible and non-immunogenic, owing to their endogenous origin, the transfer of an unknown mix of bioactive molecules can add risks to immunotherapy. Further studies are needed to gain more understanding on the exosomal composition content, and potential toxicity. Despite these obstacles, research on exosome-based immunotherapy is bound to increase, driven by more and more promising results. Costimulation is known to be crucial for immune responses, and the combination of exosomes with co-stimulatory receptors may dramatically strengthen their anti-tumor efficacy. Last but not least, considering the nanoscale size of exosomes, the combination of exosomes and other nanomaterials could be a winning strategy in cancer immunotherapy. All these novel approaches will certainly result in a rising trend of exosome-based cancer immunotherapy. This research was supported by a grant (NMRC/CBRG/ 0066/2014) from the National Medical Research Council, Singapore. Cordonnier M, Chanteloup G, Isambert N, et al. Exosomes in cancer theranostic: Diamonds in the rough. Cell Adh Migr. 2017;1(2):151-63. Bayraktar E, Helal G, Gouda K. Hela, et al. Exosomes: From Garbage Bins to Promising Therapeutic Targets. Int J Mol Sci. 2017;18(3):538. Raposo G, Nijman HW, Stoorvogel W, et al. B lymphocytes secrete antigen-presenting vesicles. J Exp Med. 1996;183(3):1161-72. Edgar JR. Q&A: What are exosomes, exactly? BMC Biol. 2016;14(46):14:46. Khalil DN, Smith EL, Brentjens RJ, et al. The future of cancer treatment: immunomodulation, CARs and combination immunotherapy. Nat Rev Clin Oncol. 2016;13(5):273-90. Song W, Musetti SN, Huang L. Nanomaterials for cancer immunotherapy. Biomaterials. 2017;148:16-30. Gehrmann U, Näslund TI, Hiltbrunner S, et al. Harnessing the exosome-induced immune response for cancer immunotherapy. Semin Cancer Biol. 2014;28: 58-67. Greening DW, Gopal SK, Xu R, et al. Exosomes and their roles in immune regulation and cancer. Semin Cell Dev Biol. 2015;40:72-81. Guo W, Gao Y, Li N, et al. Exosomes: New players in cancer (Review). Oncol Rep. 2017;38(2):665-67. Mirzaei H, Sahebkar A, Jaafari, et al. MR Diagnostic and Therapeutic Potential of Exosomes in Cancer: The Beginning of a New Tale? J Cell Physiol. 2017;232(12):3251-60. Rountree RB, Mandl SJ, Nachtwey JM, et al. Exosome Targeting of Tumor Antigens Expressed by Cancer Vaccines Can Improve Antigen Immunogenicity and Therapeutic Efficacy. Cancer Res. 2011;71(15);5235-44. Tan, H. De La Pena, A. M. Seifalian. The application of exosomes as a nanoscale cancer vaccine. Int J Nanomedicine. 2010;5:889-900. Johnsen KB, Gudbergsson JM, Skov MN, et al. A comprehensive overview of exosomes as drug delivery vehicles-Endogenous nanocarriers for targeted cancer therapy. Biochim Biophys Acta. 2014;1846(1):75-87. Vlassov AV, Magdaleno S, Setterquist R, et al. Exosomes: Current knowledge of their composition, biological functions, and diagnostic and therapeutic potentials. Biochim Biophys Acta. 2012;1820(7):940-8. Valadi H1, Ekström K, Bossios A, et al. Exosome-mediated transfer of mRNAs and microRNAs is a novel mechanism of genetic exchange between cells. Nat Cell Biol. 2007;9(6);654-9. Tran TH, Mattheolabakis G, Aldawsari H, et al. Exosomes as nanocarriers for immunotherapy of cancer and inflammatory diseases. Clin Immunol. 2015;160(1):46-58. Oksvold MP, Kullmann A, Forfang L, et al. Expression of B-Cell Surface Antigens in Subpopulations of Exosomes Released From B-Cell Lymphoma Cells. Clin Ther. 2014;36(6); 847-62. Hiltbrunner S, Larssen P, Eldh M, et al. Exosomal cancer immunotherapy is independent of MHC molecules on exosomes. Oncotarget. 2016;7(25):38707-17. Melo SA, Luecke LB, Kahlert C, et al. Glypican-1 identifies cancer exosomes and detects early pancreatic cancer. Nature. 2015;523(7559):177-82. Lydia Alvarez-Erviti, Yiqi Seow, HaiFang Yin, et al. Delivery of siRNA to the mouse brain by systemic injection of targeted exosomes. Nature Biotechnology. 2011;29:341–45. Marimpietri D, Petretto A, Raffaghello L, et al. Proteome profiling of neuroblastoma-derived exosomes reveal the expression of proteins potentially involved in tumor progression. PloS one. 2013;8(9). Momen-Heravi F, Balaja L, Alian S, et al. Current methods for the isolation of extracellular vesicles. Biol. Chem. 2013;394(10):1253–62. Witwer KW1, Buzás EI, Bemis LT, et al. Standardization of sample collection, isolation and analysis methods in extracellular vesicle research. J Extracell Vesicles. 2013;2:20360. Yakimchuk k. Exosomes: isolation and characterization methods and specific markers. Materials and Methods 5, 1450 (2015). Kang H, Kim J, Park J. Methods to isolate extracellular vesicles for diagnosis. Micro and Nano Systems Letters 5. 2017:15. Nordin JZ, Lee Y, Vader P, et al. Ultrafiltration with size-exclusion liquid chromatography for high yield isolation of extracellular vesicles preserving intact biophysical and functional properties. Nanomedicine. 2015;11(4):879-883. Lozano-Ramos I, Bancu I, Oliveira-Tercero A, et al. Size-exclusion chromatography-based enrichment of extracellular vesicles from urine samples. J Extracell Vesicles. 2015;4:27369. Taylor DD, Zacharias W, Gercel-Taylor C. in Serum/Plasma Proteomics: Methods and Protocols, R. J. Simpson, D. W. Greening, Eds. (Humana Press, Totowa, NJ, 2011), pp. 235-246. Lane E, Korbie D, Anderson W, et al. Analysis of exosome purification methods using a model liposome system and tunable-resistive pulse sensing. Scientific Reports. 2015;5:7639. Rekker K, Saare M, Roost AM, et al. Comparison of serum exosome isolation methods for microRNA profiling. Clin Biochem. 2014;47(1-2):135-8. V. Sunkara, Woo HK, Cho YK. Emerging techniques in the isolation and characterization of extracellular vesicles and their roles in cancer diagnostics and prognostics. Analyst. 2016;141(2):371-381. Clayton A, Court J, Navabi H, et al. Analysis of antigen presenting cell derived exosomes, based on immuno-magnetic isolation and flow cytometry. J Immunol Methods. 2001;247(1-2):163-174. Xu R, Greening DW, Zhu HJ, et al. Extracellular vesicle isolation and characterization: toward clinical application. J Clin Invest 2016;126(4):1152-62. Muller L, Hong CS, Stolz DB, et al. Whiteside, Isolation of biologically-active exosomes from human plasma. J Immunol Methods. 2014;411:55-65. Sinha S, Hoshino D, Hong NH, Cortactin promotes exosome secretion by controlling branched actin dynamics. J Cell Biol. 2016;214(2):197-213. D. W. Greening, R. Xu, H. Ji, B. J, et al. Simpson, Proteomic Profiling: Methods and Protocols. A. Posch, Ed. 2015:179-209. Pedersen KW, Kierulf B, Manger Iet al. Direct Isolation of Exosomes from Cell Culture: Simplifying Methods for Exosome Enrichment and Analysis. Trans Biomed. 2015;6:1-9. Arraud N, Gounou C, Turpin D, et al. Fluorescence triggering: A general strategy for enumerating and phenotyping extracellular vesicles by flow cytometry. Cytometry A. 2016;89(2):184-95. Morales-Kastresana, Bill Telford, Thomas A. Musich, et al., Labeling Extracellular Vesicles for Nanoscale Flow Cytometry. Scientific Reports. 2017;7:1878.
van der Vlist EJ, Nolte-'t Hoen EN, Stoorvogel W, et al. Fluorescent labeling of nano-sized vesicles released by cells and subsequent quantitative and qualitative analysis by high-resolution flow cytometry. Nat Protoc. 2012;7(7):1311-26. Zhang X, Yuan X, Shi H, et al. Exosomes in cancer: small particle, big player. J Hematol Oncol. 2015;8:83. Théry C, Ostrowski M, Segura E. Membrane vesicles as conveyors of immune responses. Nat Rev Immunol. 2009;(8):581-93. Natasha G, Gundogan B, Tan A, et al. Exosomes as Immunotheranostic Nanoparticles. Clin Ther. 2014;36(6):820-9. Shao K, Singha S, Clemente-Casares X, et al. Nanoparticle-Based Immunotherapy for Cancer. ACS Nano. 2015;9(1):16-30. Koshy ST, Cheung AS, Gu L, et al. Liposomal Delivery Enhances Immune Activation by STING Agonists for Cancer Immunotherapy. Adv Biosys 2017;1:1600013. Yuba E. Liposome-based immunity-inducing systems for cancer immunotherapy. Mol Immunol. 2017;S0161-5890(17):30558. Jiang XC, Gao JQ. Exosomes as novel bio-carriers for gene and drug delivery. Int J Pharm. 2017;521(1-2):167-175. Rana S, Yue S, Stadel D, et al. Toward tailored exosomes: The exosomal tetraspanin web contributes to target cell selection. Int J Biochem Cell Biol. 2012;44(9):1574-84. Behzadi E, Hosseini HM, Halabian R, et al. Macrophage cell-derived exosomes/staphylococcal enterotoxin B against fibrosarcoma tumor. Microb Pathog. 2017;111:132-8. Mahmoodzadeh Hosseini H, Imani Fooladi AA, Soleimanirad J, et al., Staphylococcal entorotoxin B anchored exosome induces apoptosis in negative esterogen receptor breast cancer cells. Tumour Biol. 2014;35(4):3699-707. Morishita M, Takahashi Y, Matsumoto A, et al. Exosome-based tumor antigens–adjuvant co-delivery utilizing genetically engineered tumor cell-derived exosomes with immunostimulatory CpG DNA Biomaterials. 2016;111:55-65. Yang T, Martin P, Fogarty B, et al. Exosome Delivered Anticancer Drugs Across the Blood-Brain Barrier for Brain Cancer Therapy in Danio Rerio. Pharm Res. 2015;32(6):2003-14. Qiu H, Min Y, Rodgers Z, Zhang L, et al. Nanomedicine approaches to improve cancer immunotherapy. Wiley Interdiscip Rev Nanomed Nanobiotechnol. 2017;9(5). Aung T, Chapuy B, Vogel D, et al. Exosomal evasion of humoral immunotherapy in aggressive B-cell lymphoma modulated by ATP-binding cassette transporter A3. Proc Natl Acad Sci U S A. 2011;108(37):15336-41. Hong CS, Sharma P, Yerneni SS, et al. Circulating exosomes carrying an immunosuppressive cargo interfere with cellular immunotherapy in acute myeloid leukemia. Sci Rep. 2017;7:14684. Muller L, Simms P, Hong CS, et al. Human tumor-derived exosomes (TEX) regulate Treg functions [ cell surface signaling rather than uptake mechanisms. Oncoimmunology. 2017;6:e1261243. Taylor DD, Gerçel-Taylor C, Lyons KS, et al. T-Cell Apoptosis and Suppression of T-Cell Receptor/CD3-ζ by Fas Ligand-Containing Membrane Vesicles Shed from Ovarian Tumors. Clin Cancer Res. 2003;9(14):5113-9. Yu S, Liu C, Su K, et al. Tumor Exosomes Inhibit Differentiation of Bone Marrow Dendritic Cells. J Immunol. 2007;178(11):6867-75. Xiang X, Poliakov A, Liu C, et al. Induction of myeloid-derived suppressor cells by tumor exosomes. Int J Cancer. 2010;124: 2621-33. Chen X, Ying X, Wang X, et al., Exosomes derived from hypoxic epithelial ovarian cancer deliver microRNA-940 to induce macrophage M2 polarization. Oncol Rep. 2017;38(1):522-528. Wieckowski EU, Visus C, Szajnik M, et al. Tumor-Derived Microvesicles Promote Regulatory T Cell Expansion and Induce Apoptosis in Tumor-Reactive Activated CD8<sup>+</sup> T Lymphocytes. J Immunol. 2009;183(6):3720-30. Marleau AM, Chen CS, Joyce JA, et al. Exosome removal as a therapeutic adjuvant in cancer. J Transl Med. 2012;10:134. Cho JA, Lee YS, Kim SH, et al. MHC independent anti-tumor immune responses induced by Hsp70-enriched exosomes generate tumor regression in murine models. Cancer Lett. 2009;275(2):256-65. Jang JY, Lee JK, Jeon YK, et al. Exosome derived from epigallocatechin gallate treated breast cancer cells suppresses tumor growth by inhibiting tumor-associated macrophage infiltration and M2 polarization. BMC Cancer. 2013;13:421. Rao Q, Zuo B, Lu Z, et al. Tumor-derived exosomes elicit tumor suppression in murine hepatocellular carcinoma models and humans in vitro. Hepatology. 2016;64(2):456-72. Lu Z, Zuo B, Jing R, et al. Dendritic cell-derived exosomes elicit tumor regression in autochthonous hepatocellular carcinoma mouse models. J Hepatol. 2017;67(4):739-748. Zitvogel L, Regnault A, Lozier A, et al. Eradication of established murine tumors using a novel cell-free vaccine: dendritic cell derived exosomes. Nat Med. 1998;4(5):594-600. Admyre C, Johansson SM, Paulie S, et al. Direct exosome stimulation of peripheral humanT cells detected by ELISPOT. Eur J Immunol. 2006;36(7):1772-81. Utsugi-Kobukai S, Fujimaki H, Hotta C, et al. MHC class I-mediated exogenous antigen presentation by exosomes secreted from immature and mature bone marrow derived dendritic cells. Immunol Lett. 2003;89(2-3):125-31. Théry C, Duban L, Segura E, et al. Indirect activation of naïve CD4+ T cells by dendritic cell–derived exosomes. Nat Immunol. 2002;3(12):1156-62. Vincent-Schneider H, Stumptner-Cuvelette P, Lankar D, et al. Exosomes bearing HLA-DR1 molecules need dendritic cells to efficiently stimulate specific T cells. Int Immunol. 2002;14:713-22. Montecalvo A, Shufesky WJ, Stolz DB, et al. Exosomes As a Short-Range Mechanism to Spread Alloantigen between Dendritic Cells during T Cell Allorecognition. J Immunol. 2008;180(5):3081-90. Marino J, Babiker-Mohamed MH, Crosby-Bertorini P, et al. Donor exosomes rather than passenger leukocytes initiate alloreactive T cell responses after transplantation. Sci Immunol. 2016;1(1):aaf8759. Nakayama M. Antigen Presentation by MHC-Dressed Cells. Front Immunol. 2015;5:672. Munich S, Sobo-Vujanovic A, Buchser WJ, et al. Dendritic cell exosomes directly kill tumor cells and activate natural killer cells via TNF superfamily ligands. Oncoimmunology. 2012;1(7):1074-1083. Reiners KS, Dassler J, Coch C, et al. Role of Exosomes Released by Dendritic Cells and/or by Tumor Targets: Regulation of NK Cell Plasticity. Front Immunol. 2014;5:91. Viaud S, Terme M, Flament C, et al. Dendritic Cell-Derived Exosomes Promote Natural Killer Cell Activation and Proliferation: A Role for NKG2D Ligands and IL-15Rα. PLoS ONE. 2009;4(3):e4942. Pitt JM, André F, Amigorena S, et al. Dendritic cell–derived exosomes for cancer therapy. J Clin Invest. 2016;126(4):1224-32. Anderson KG, Stromnes IM, Greenberg PD. Obstacles Posed by the Tumor Microenvironment to T&#xa0;cell Activity: A Case for Synergistic Therapies. Cancer Cell. 2017;31(3):311-25. Failli A1, Legitimo A, Orsini G, et al. Numerical defect of circulating dendritic cell subsets and defective dendritic cell generation from monocytes of patients with advanced melanoma. Cancer Lett. 2013;337(2):184-92. O'Toole A, Michielsen AJ, Nolan B, et al. Tumour microenvironment of both early-zxand late-stage colorectal cancer is equally immunosuppressive. Br J Cancer. 2014;111(5):927-32. Pinzon-Charry A, Maxwell T, López JA, et al. Dendritic cell dysfunction in cancer: a mechanism for immunosuppression. Immunol Cell Biol. 2005;83(5):451-61. Liu C, Yu S, Zinn K, et al. Murine mammary carcinoma exosomes promote tumor growth by suppression of NK cell function. J Immunol. 2006;176(3):1375-85. Imai T, Takahashi Y, Nishikawa M, et al. Macrophage-dependent clearance of systemically administered B16BL6-derived exosomes from the blood circulation in mice. J Extracell Vesicles. 2015;4(1). Bellavia D, Raimondo S, Calabrese G, et al. Interleukin 3-receptor targeted exosomes inhibit in vitro and in vivo Chronic Myelogenous Leukemia cell growth. Theranostics. 2017;7(5):1333-45. Gehrmann U, Hiltbrunner S, Georgoudaki AM, et al. Synergistic induction of adaptive antitumor immunity by codelivery of antigen with α-galactosylceramide on exosomes. Cancer Res. 2013;73(13):3865-76. Ulf Gehrmann, Stefanie Hiltbrunner, Tanja I Näslund, et al. Potentiating antitumor immunity with αGC-loaded exosomes. Oncoimmunology. 2013;2(10):e26261. Chaput N, Schartz NE, André F, et al. Exosomes as potent cell-free peptide-based vaccine. II. Exosomes in CpG adjuvants efficiently prime naive Tc1 lymphocytes leading to tumor rejection. J Immunol. 2004;172(4):2137-46. Fang Huang, Jiangbo Wan, Siguo Hao, et al. TGF-β1-silenced leukemia cell-derived exosomes target dendritic cells to induce potent anti-leukemic immunity in a mouse model. Cancer Immunol. 2017;66(10): 1321–31. Yang Y, Xiu F, Cai Z, et al. Increased induction of antitumor response by exosomes derived from interleukin-2 gene-modified tumor cells. J Cancer Res Clin Oncol. 2007;133(6):389-99. Li W, Mu D, Tian F, et al. Exosomes derived from Rab27a‑overexpressing tumor cells elicit efficient induction of antitumor immunity. Mol Med Rep. 2013;8(6):1876-82. Tang XJ, Sun XY, Huang KM, et al. Therapeutic potential of CAR-T cell-derived exosomes: a cell-free modality for targeted cancer therapy. Oncotarget. 2015;6(42):44179-90. Benjamin Besse, Mélinda Charrier, Valérie Lapierre, et al. Dendritic cell-derived exosomes as maintenance immunotherapy after first line chemotherapy in NSCLC. Oncoimmunology. 2016;5(4): e1071008. Dai S, Wei D, Wu Z, et al. Phase I clinical trial of autologous ascites-derived exosomes combined with GM-CSF for colorectal cancer. Mol Ther. 2008;16(4):782-90. Bernard Escudier, Thierry Dorval, Nathalie Chaput, et al. Vaccination of metastatic melanoma patients with autologous dendritic cell (DC) derived-exosomes: results of thefirst phase I clinical trial. J Transl Med. 2005;3:10.